This is going to get abstract for a paragraph or two, but hang in there and hopefully it’ll become clear. Peirce, like plenty of modern philosophers, thought a lot about how signs (their fancy word for what most of us would call symbols) refer to other objects – for example, how does the word “dog” relate to whatever dog you just imagined? Peirce’s important point is that there are different types of these relationships between objects. Words, for example, refer to objects by habit or convention. That makes sense, right? The word “dog” is arbitrary – there’s no necessary link between that particular sequence of letters and our furry companions. In contrast, think about a weathervane in the wind. 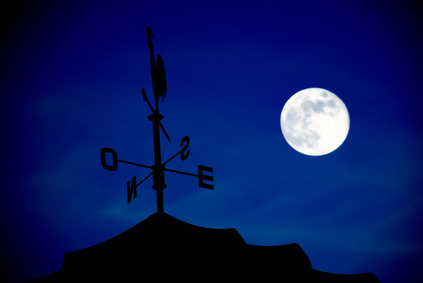 That weathervane refers to the direction of the wind, but in this case the relationship isn’t arbitrary– the two things are directly connected. That’s the essential part of indexing: the weathervane is an index for the direction of the wind, because it’s directly related to the thing it’s referring to (the wind). If this still seems a little ridiculous, consider how we use the word “indicate.” It’d sound funny to say the word “dog” indicates a dog, but it’s pretty natural to say a weathervane indicates the direction of the wind. Maybe some more examples will help. Leaves changing colors is an index for autumn. A cough and headache indicate a cold. Bowing can indicate reverence. In each of these examples the relationship isn’t arbitrary; instead there’s a direct connection between the two. This difference between symbols (like words) and indices is important because it highlights how there are certain things that are significantly more appropriate to show rather than tell. Take the bowing example – I can tell you about my reverence, or I bow towards my altar every morning. Which is more reliable? Maybe the point is better made with something closer to home: I can tell you I’m a trustworthy friend, or I can pick you up from the airport, help you move, not share your private information… By now you’re probably thinking that this is the most roundabout way possible for me to say what we already know: actions speak louder than words. But I want to go further – indexes point to types of experiences, layers of reality, that we otherwise can’t access. Let’s stick with the friendship example. Would such a thing as friendship exist without the actions and behaviors that indicate friendship? Words can point to the wonderful experience of having a friend, but the substance of the thing itself is filled in by what we do. At the level of words alone, we can’t approach something like friendship – instead we need the sharing of food and stories and experiences that point to friendship. Those actions not only indicate friendship, they create it. So what does any of this has to do with religion? Many people have argued that religious concepts like the sacred, meaning, or eternity are similar to friendship in this regard. The rituals that indicate the sacred also create the sacred. If that sounds too much like we just make the sacred up, you could also say those rituals allow our access to the experience of the sacred. Either way works because the question isn’t whether or not the sacred is real. After all, nobody contests whether or not friendship is real. Instead the insight is that you can’t point to the sacred with words alone. When you bow towards an altar, you’re not only indicating sacredness, you’re also making the experience sacred. Or take something like meaning. David Brooks of the NYTimes recently wrote an opinion piece about the problems that emerge when we judge meaning by whether or not something feels good. He’s right; meaning isn’t just a feeling. But he never gets around to describing what meaning is. That’s probably because you can’t point to meaning through words alone – you only know it by being involved with it. But once you are involved with meaning, whether through generosity or creativity or beauty, the question of whether or not it’s real dissipates. Instead, your primary concern becomes the processes of engaging, exploring, and participating in meaning. This concept of indexing is so important because we live in a culture that values sincerity nearly above all else. Sincerity is undergirded by the assumed importance of individual autonomy and personal expression. We want what is real and genuine and are deeply suspicious of that which may be forced or scripted, seeing those as signs of hollowness or falsehood. The easiest escape from this mindset is to reject sincerity through an irony that assumes all is hollow – think about how hipster culture ironically adopts trends that are authentic for others and wears them as a joke. But even in this rejection, irony accepts sincerity as its standard. The unspoken assumption of this demand for sincerity is that the real can be directly referenced. I can see dogs and trees, so they must be real. But the holy, or the sacred, or value and meaning… those are harder to see and refer to. Therefore, sincere culture questions whether they are real or not. Think about how critics of religion describe the rituals as empty, dried-up, vacuous, and therefore meaningless conventions. These rituals are some of the primary victims of the demand for sincerity. In this setting, discussions ignore what the rituals do and focus on whether the rituals refer to anything real. That’s the demand of sincerity– participation must be genuine, which requires that the rituals must be real from the beginning. But do you see the catch-22? If the ritual itself is part of what creates the sacred, then the only way to know about the sacred is to participate. But if you demand that the sacred be real from the outset, then you’re never going to participate in the ritual, thus confirming your suspicions that the sacred is a bunch of baloney. Round and round we go. The demand for sincerity is dangerous because it flattens reality into that which is immediately apparent. It forecloses our engagement with levels of reality that demand prolonged involvement and trust. If you’re not too concerned with the sacred, think about love. It follows the same pattern. If you demand love at face value, you’re unlikely to engage in a relationship fully enough or persist long enough for the deep trust and intimacy and knowing of love to develop. When we demand sincerity, these complex and rich, but subtle, levels of experience and reality are foreclosed before they’re even approached. The difference between symbols and indexes highlights this point, but it isn’t necessary to appreciate the importance. So the next time you encounter a discussion about whether the sacred or God or meaning or love are real, think about whether these are the sorts of things we can easily point to or not. And if we can’t easily point to them with words, then perhaps action and participation, and dare I say ritual, are the appropriate ways to know them. If you follow this line of thinking far enough, you begin to see how experience and reality are constructed by opportunities to act, and act in ways that can access some of the deeper, and more beautiful, layers of our world.